NS BlueScope Lysaght Malaysia Sdn Bhd, the country’s largest metal roofing and walling player with a 20% share in the mid-range and high-end markets, is targeting revenue growth of 5% in its financial year ending June 30, 2015 (FY2015), in line with the country’s forecast gross domestic product (GDP) growth rate. According to president Ng Say Teck, the company generated revenue of RM120 million in FY2014, up 7% from FY2013. Acknowledging that 5% revenue growth is not an ambitious goal, he says it is realistic for the group, given the market uncertainties caused by falling oil prices. “The slower growth in FY2015 will be due to a slowdown in the property market, a pullback in capital expenditure due to a collapse in oil prices and the scaling down of expansion plans by industry players,” Ng tells The Edge. Established in1968, NS BlueScope Lysaght Malaysia is a pioneer in the manufacture of steel-making products in the country. Its product range includes roofing and walling, roof trusses and building structures. The company is a 60:40 joint venture between NS BlueScope Lysaght Singapore Pte Ltd and Singapore-listed United Engineers Ltd (UEL). To recap, BlueScope Lysaght (M) Sdn Bhd was incorporated in Malaysia in 1968 and was initially known as John Lysaght. The company was renamed NS BlueScope Lysaght Malaysia in 2012 after Nippon Steel Sumitomo Metal Corp of Japan came into the picture as a joint-venture partner. There is no connection between NS BlueScope Lysaght Malaysia and public listed Lysaght Galvanized Steel Bhd (LGS). However, it is worth noting that UEL is a common shareholder of NS BlueScope Lysaght Malaysia and LGS as the Singapore company has an 11.63% stake in Lysaght (M) Sdn Bhd, the controlling shareholder of LGS with a 55.14% stake. NS BlueScope Lysaght Malaysia has manufacturing operations in Kota Kinabalu, Bintulu, Kuching and Shah Alam with a combined capacity to produce close to 20,000 tonnes per annum of roofing and walling materials. “At the moment, we have adequate production capacity for our existing product range. Plans are underway to invest in capacity to manufacture new innovative products in the coming financial years,” says Ng, adding that the company will allocate 2% to 3% of its revenue to R&D every year. He also highlights the government’s announcement in the revised Budget 2015 that the development expenditure of RM48.5 billion for the year will be maintained and spent. NS BlueScope Lysaght Malaysia is expected to benefit from the spillovers from mega-infrastructure projects, such as the mass rapid transit (MRT), light rail transit (LRT) extension and West Coast Expressway. Meanwhile, the weakening ringgit should boost the export activities of local manufacturers. Thus, NS BlueScope Lysaght Malaysia, which also serves clients in the industrial sector, will be able to supply more products. “Local exporters are expected to undertake factory expansion, which means rising demand for our products,” says Ng. The company’s roofing and walling segment contributes about 80% to revenue while the remaining 20% comes from structural products. NS BlueScope Lysaght Malaysia was involved in some of the country’s landmark projects, such as the Petronas Twin Towers, the Kuching Airport, LRT Phase 2, Curtin University, Hershey’s confectionery plant and the National Cancer Institute. “Our differentiation comes from fully tested product performance and stringent quality control and procedures, offering total peace of mind to loyal global clientele, such as Coca-Cola, Toyota and Nestlé,” Ng says. Moving forward, NS BlueScope Lysaght Malaysia will be seeking growth in the retail market by launching new products as it expects a weak consumer spending pattern and slowdown in the building industry. “In the next two to three years, we want to explore the retail market, which, in our view, is a potential growth area. We want to provide a one-stop centre for roofing solutions to end-users,” Ng comments. 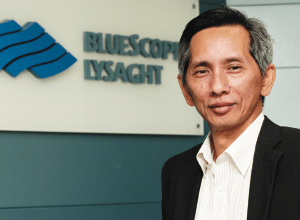 He believes with an enhanced service-based and total solution philosophy, coupled with a strategic alliance with Nippon Steel and access to the capacity and resources of sister companies in the region, NS BlueScope Lysaght Malaysia will continue to stay relevant to its customers.